GOTCHA ! The Ozelot is twinking his left eye to the photographer. The first construction materials that we buy: 34 sticks of bamboo, approx 10m long. Carrying materials: the 10m bamboo sticks weigh up to 50kg each. A machete is great tool for construction. The wonderful local family, from whom we are renting some land during the construction. The father and his two 20-something sons help us construct the raft while the women cook lunch for us. 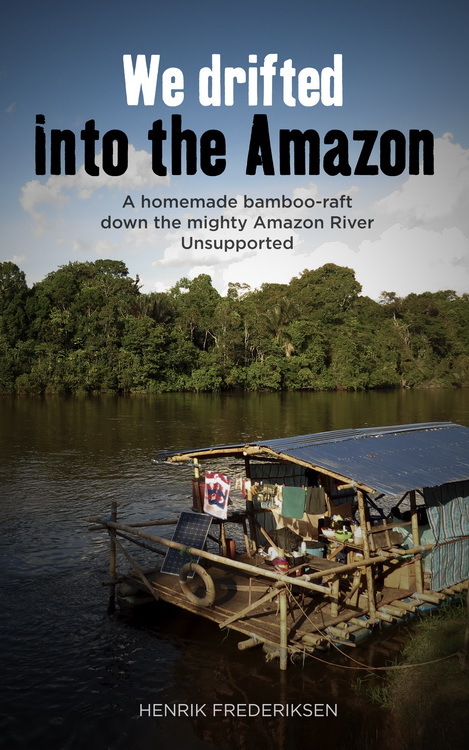 The family belong to the Shuar Trinbe who have lived in the Amazonia jungle for milennia. The father is preparing some fishingnets in this photo. How do you make a cheap fireplace/grill? … you go to the local Ecuadorian scrapyard and buy the bottom 20cm of an oil-barrel and a old metalframe for a table, then weld it together. In the bottom of the photo is our two anchors, also made cheap from the local scrapyard with the help of a car-mechanic who could cut and weld metal. Wow what a amazing treat just to watch it, let alone be there!